The E525-901G16Mi from eMachines is suited to those after a no-nonsense portable solution. 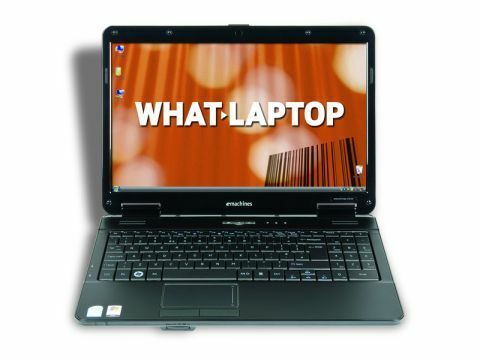 It boasts more power than the Elonex Sliver and Acer Aspire 1410-74G25n, and provides good competition for the Lenovo – which are other similarly specified rivals. The 15.6-inch screen isn't as sharp as the Elonex's, but still provides detailed images courtesy of the 1366 x 768-pixel resolution. As with all a lot of other laptops, a glossy Super-TFT screen coating is in place but it suppresses reflections in bright light well, and you won't have a problem viewing it outdoors, for example. The laptop features a pleasantly inoffensive design that's attractive enough in its own way, and build quality is good, meaning it will take a few light bumps and bashes on the road. The laptop keyboard has a spongy response and yet the typing action is surprisingly good, with large, well-spaced keys making it a very accurate board, although ultimately we prefer the solidity of the Lenovo G550 keyboard better. Like the aforementioned Lenovo, a dedicated numeric keypad is also included, making inputting data especially easy. This laptop uses the same Intel processor as the Lenovo, yet it has 1024MB less memory and, as a result, the Lenovo offers more power and performance. This should be a consideration if you intend to multi-task or run resource-intensive programs. Nevertheless, running everyday applications won't be an issue. However, this is no multimedia machine, but you'll be able to carry out minor photo editing, thanks to the integrated Intel graphics chip, and even play internet games without too much hassle. The 160GB hard drive provides enough room for all your files and folders, alongside moderate multimedia libraries. However, if you're looking to store a lot of data, then you're sure to find the extra 90GB the Lenovo offers useful. Unlike the Acer and Elonex, the laptop isn't specifically designed to be very portable. The 2.5kg the machine weighs isn't cripplingly heavy, however, and the 216-minute battery life is acceptable (we expect a minimum of at least 180 minutes), although is beaten by the Lenovo. A media card reader is also included, which will suit those who want to download their photos off their digital cameras without all the fuss of using USB cables. The eMachines E525-901G16Mi is a very likeable machine which does a lot well, but the Lenovo offers better power, portability and usability across the board, making it the better option.